A leaking roof ranks as one the most damaging problems for a roof system. There are many causes for a leaking roof, and a great concern is when that leakage seeps into internal space of the house. This can happen because many times the leak occurs between the roof and the wall of the house. Water can also get into attic. The things you need check to repair the leak are the following: shingles, underlayment, flashing, roof sheathing, eaves, valleys and dormers. Shingles are the main protection against a leaking roof. When checking the shingles, you need to begin by examining the shingles above those where the leak is. Many times the downward flow of the water causes the lower shingles to leak. You need also to look for curled shingles because the curling may indicate that water has penetrated those shingles. 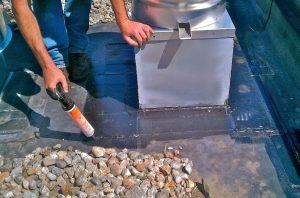 Underlayment is the extra layer of protection over the sheathing from a leaking roof. It is usually made out of felt and is required by shingle manufacturers’ warrantees. It is also a standard that is set out for fire, weather and puncture safety. The roof sheathing comprises the main covering of the roof that’s how it prevents a leaking roof, so protecting the roof sheathing from water damage is crucial. On the sheathing, leaks are particularly common around the chimney, plumbing vent and attic vents. The perimeters of these above mentioned areas must be tightly encased in waterproof materials and substances to assure protection against water. Pipes, conduits, and telecommunications, which penetrate the sheathing by making pathways, weaken the roofing system and make it vulnerable to rain damage. Double checking the work of these professionals to ensure that they have not violated the integrity of the roofing system may save your client future problems. The purpose of flashing is to create a watertight barrier between roof sections, roofing projections and other parts of the structure, and between roofing materials and roof projections. Flashing destruction causes a leaking roof. The main ways to avoid flashing problems are first to examine your architectural designs to see if there are any flaws in the design that might lead to flashing problems. Second, make sure to install all flashing materials properly. Incorrect installment of flashing materials is one of the main causes of leaking. Third, in the construction process, build in features that reduce the effects of wind because wind is another destructive factor in relation to flashing. Roofing barrier systems help protect the roofing system from a leaking roof in some of the most vulnerable areas: eaves, valleys, and dormers. The primary purpose of eaves is to prevent rainwater from entering the ingress between the roof and the wall of the structure. To perform its function, the eave has to be properly designed. It’s important that you stress to the architect that form must equal function. Proper installation is always primary. If its an aging structure, the eaves may need to be replaced. Dormers are windowed structured, utilized to expand the size of a home, and are situated on the roof. What is problematic about many dormers is that they don’t include an outdoor drainage system, like gutters. Instead, when it rains, the water pours directly onto the roof. Strategizing a simple water removal method for the dormers on your roofing systems, would save a lot of potential problem. Roof valleys are formed when two adjoining sides of a roof meet at a downward angle and create a crevice. Valleys are natural receptacles of water and cause a leaking roof because of their deep V shape. Like dormers, valleys don’t have any built-in drainage systems. A number of diversion systems are in use to offload the rainwater. Water collection systems are being used as one of the diversions for roof valleys because of the volume of water stored in that part of the roof.